Avast and ahoy, mates! As promised, in the Pirate Tea – All Hands On Deck blog posted yesterday, here is my recipe for the Bacardi Rum cake with a little kick of ginger. I prefer spiced rum vs. dark rum for this treasure. If you want to use the other brand of rum bearing a captain’s figure . . . why not? Thar be pirates here! For the scurvy purists, I’ve made rum cake from scratch and quite frankly once the rum is poured, it does not matter to me that this cake is made from a mix. Arrr! Let’s get Kraken, oops, cracking . . . eggs that is, step smartly, and Yo Ho Ho seize the bottle of rum! Preheat oven to 325°F – rack in center. Spray 12” Bundt® pan with Pam® Baking Spray or Baker’s Joy®. Sprinkle pecans in the bottom of pan. Set aside. Whisk together cake mix, pudding and ground ginger in large mixing bowl. Add rum, oil, water and eggs; blend with electric mixer on low speed for 1 minute. Stop the machine; scrape down the sides of the bowl with rubber spatula. Add fresh grated ginger. Increase mixer speed to medium and beat 2 minutes, scraping down sides if needed. Pour batter into prepared pan, smooth top with rubber spatula and tap pan on counter a few times to release some of the air bubbles. Bake cake 1 hour, or until golden brown. Remove pan from oven and place on a wire rack to cool for about 20 minutes. Make the glaze while cake is cooling. Melt butter in a saucepan over low heat. Stir in water and sugars. Bring mixture to a boil over medium heat. Reduce heat slightly; cook 5 minutes, stirring constantly. Remove pan from heat, add ground ginger using a whisk to blend out any lumps. Slowly add spiced rum (it will bubble up), stir to blend. Do not pour alcohol anywhere near an open flame or hot burner. Invert cake on a serving platter. Poke holes in the top and sides of cake with a wooden skewer. Pour half the glaze in the Bundt® pan, flip cake back over and carefully return it to the pan making sure to match up the ridges. Poke holes in the bottom of cake. Pour the rest of the glaze evenly over top and down the sides (not letting it go over the hole in center of pan). Let stand until glaze is absorbed about 15 minutes. Invert cake onto the serving platter. Cool cake completely before topping with chocolate. Place chocolate morsels in small resealable plastic bag. Microwave sealed bag 60 seconds at half power. Turn bag over; heat 60 seconds at half power. Knead bag until candy is smooth. All microwaves are different; it may take another 30 seconds more or less at half power. Just don’t heat it too long, chocolate burns easily. Cut tiny corner off bag; drizzle melted chocolate over top and sides of cooled cake. Sprinkle top with candied ginger bits. Fill center of cake with additional candied ginger bits, if desired. For Pirate Tea, serve on gold charger surrounded with brown sugar sprinkled around the cake to look like “sand” or place gold candy coins on the rim of charger. If decadence is desired, serve with dollops of sweetened whipped cream. 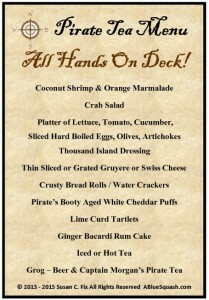 Enjoy and eat up, me hearties! Avast! September 19, 2015 is International Talk Like a Pirate Day. By putting together suggestions for a Pirate Tea, I be honoring the day and continuing with ABlueSquash.com’s theme of the month, Pirate! 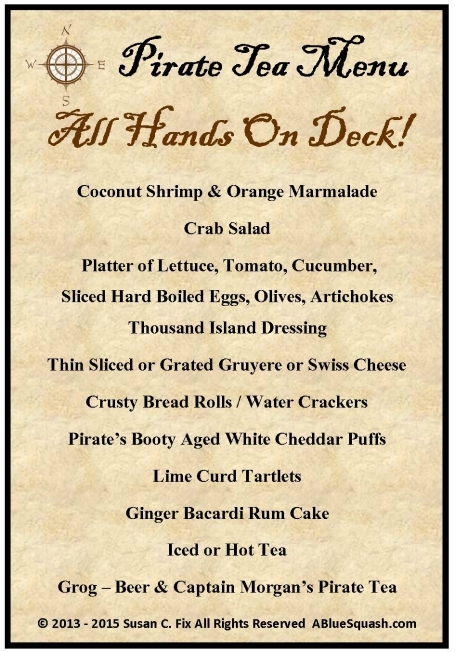 All Hands on Deck is a fitting theme for a business to thank employees for their efforts or to launch a new project. See tips and activities below – walking the plank is left out. Same theme. Same menu. Couple of different strategies for family and friends projects. Set a budget based on what you can afford and set time commitments. Decide what you absolutely can or cannot live without. Create or download a detailed event / party checklist from the tons available online. Factor in costs of food, beverages, decorations (including centerpieces BTW: real gold coins will break the treasure chest), room rental (if needed), serving pieces, utensils, table coverings (none if you have wood tables) and favors / gifts. Assign or hire a photographer. Remember to post the images of everyone having a great time on social media sites. DO IT YOURSELF OR CATERED? When planning a thank you for family or friends, depending on the number of people involved, you may choose to provide everything yourself. On the other hand (or hook), get out of the galley, have it catered. Get recommendations and a minimum of three estimates. Give them the suggested menu or work with additional input. I would never go the potluck route for a thank you or project launch. Unless hardtack, dried beef and a gallon of beer a day appeals to you, I would not suggest eating like a pirate. For a fun read, check out the National Geographic article Eat Like a Pirate. You might make copies of this for employees and guests. Serving the crab salad separately accompanied by fixings allows the low carb enthusiasts to enjoy the party without scraping the salad off bread. Arrr! Rum cake is required. I believe it is one of the pirate codes or guidelines. 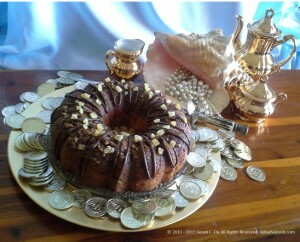 Bake your own or use my recipe for Ginger Bacardi Rum Cake . If you live in northern Nevada, purchase a rum cake from local favorite Rum Cakes, Etc. And this is why you have a budget. From hiring a Johnny Depp look-alike (swoon) to creating a mock sailing ship where folks literally walk up a gangplank to reach the festivities a person could go nuts with the possibilities. Boards on a table or planks set across sawhorses, seashells, gold coins, pearls, jewels, wood barrels, swords and cutlasses, red bandanas, sails and sailing ships, eye patches, treasure chests, skulls, netting, flags, cannons, stubby candles, gold chargers, silver and gold bars, ship’s wheels and signs with pirate sayings. Sand can be annoying in the wrong places. Never use it around food – use brown sugar instead. When there is a large project to accomplish, bring all the employees together and have the “Captain” launch the venture during a Pirate Tea lunch. Even if all employees will not be involved, describing the project as an overall benefit to the business keeps everyone in the loop and makes them feel like part of the crew. Email a company-wide invitation that says “Shiver Me Timbers It’s All Hands On Deck.” Ask your graphic designer or one of your creative-thinking employees to design it with a pirate theme or as a treasure map. Include the date, time and for the location put an X marks the spot on the lunchroom or site of the event. Get the crew on board by capturing their imaginations with a Lost at Sea survival scenario. The point of this role-playing situation is communication, decision making and helping the team understand that a group of people pooling their knowledge and thinking together generally arrive at better decisions than a person thinking alone. Click here for Wilderdom’s website page. It includes instructions and four free choices of Lost At Sea exercises with all the information you need for smooth sailing. All hands on deck for a weekend filled with chores? Moving day? Painting the house? When the entire family is involved in a project or friends are pitching in to help, it’s a great time to surprise them with a Pirate Tea. If the crew isn’t worn out from swabbing the deck, choose one of the many games found on the original Talk Like a Pirate website.